Have you ever had deep dried butter? How about chicken fried bacon? If not I imagine you haven’t been to a State Fair lately. There seems to be a philosophy at these fairs that says if you can eat it, you can fry it. Oreos, ice cream, kool aid, twinkies and butter (I kid you not. Here’s a video of it.) are just a few of the yummy delicacies to be had at State Fairs these days. Traveling in the RV as we do, we keep on the lookout for these events. They are alway a fun way to spend a few hours enjoying the local color. 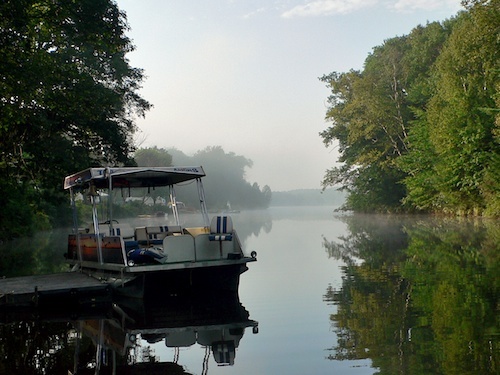 When Hubby got tired of fishing for trout in the Northwoods, we moved south 80 miles to Twin Rivers campground, in Skowhegan, Maine to find some smallmouth bass. As it turns out, we also found the State Fair was opening and we couldn’t pass that up. 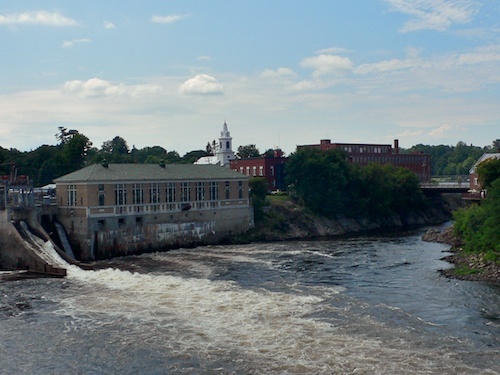 Skowhegan, an old New England mill town, sits in a pretty spot on the Kennebec River. Literary types might remember Richard Russo’s Pulitzer Prize winning novel, Empire Falls. 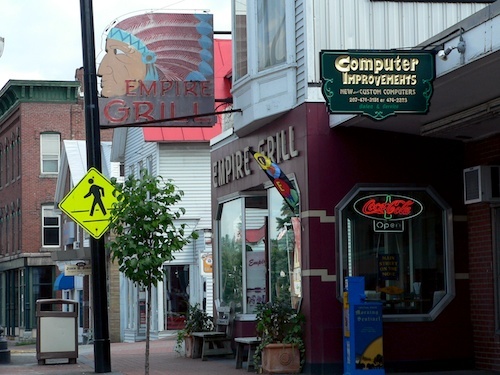 It takes place in the small, decaying town of Empire Falls, Maine and the central character is the manager of the Empire Grill. The grill, where the movie Empire Falls was filmed, is in Skowhegan and we had lunch there. In true hollywood tradition, when making the film, they took a local Pizza parlor and turned it into the small town diner, and so it remains, the remnant of a Hollywood set, now a tourist attraction, serving run-of-the-mill food. 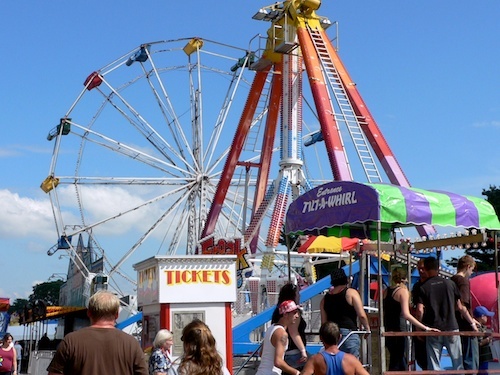 The Skowhegan State Fair was not so run-of-the-mill. First of all they has harness racing, which was different. We aren’t big bettors, but we do enjoy watching the horses. Horses weren’t the only animals racing that day. 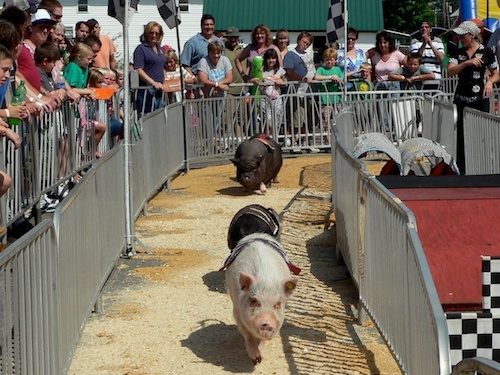 We also enjoyed the thrill of the pig races as well. Nothing like the plodding speed of lumbering pigs to get your heart racing. The fair had all standard attractions. The world’s smallest horse. Cows, chickens and other livestock waiting to be judged. 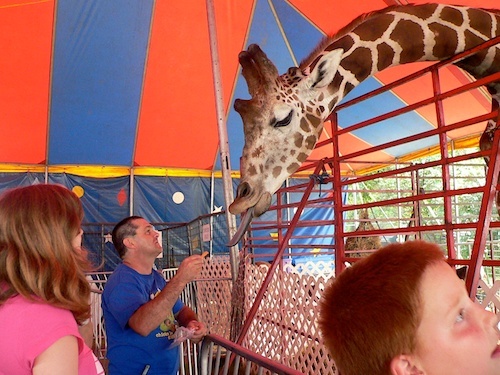 We weren’t sure why the giraffes were there, but they were popular with the kids and we learned how long and black their tongues are. Local artists, quilters and photographers had their best works on display and there were the usual rides and live entertainment. What is a funnel cake?? It’s pretty standard at fairs and carnivals …and people wonder why Americans are so fat? Thanks for that!! Fat, sugar, salt, they know how to push the buttons!!! Sometimes life has to take priority to the blogoshere. So fried butter whets your appetite? ?